I heard this song while doing some work at my desk this morning. I’ve heard it before – I love Jon McLaughlin and have many of his songs on my Spotify favorites list – but somehow I never really heard these lyrics as powerfully as today. Maybe I needed to hear it today – maybe you do too. We sang this song yesterday in our worship service – led by our new music minster, Ben Sorte. The song is from “Jesus Culture” and it’s a great one. The lyrics have been with me from then until now and just had to share this song with you. The amazing grace of Jesus that never runs out and never gives up on me. Are you ever afraid that His grace will run out? That He will give up on you? I encourage you to listen to this song today. No matter what you’re going through today – I trust that you will remember His amazing grace. When all else in your life fails – His one thing will always remain. 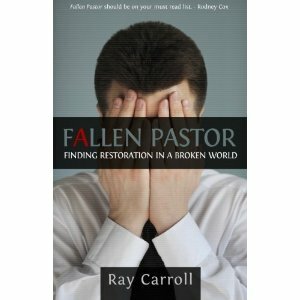 Yesterday I received the book, “Fallen Pastor” in the mail. I got my copy early because I did a pre-order on the book and knew about it from the inception. The reason? I’m privileged to know Ray Carroll personally. We met through the wonderful blogging community about 2 years ago, and have been great friends since then. He is a former Southern Baptist Pastor who had a fall from grace, and lived to tell about it – but more than that, He lived to write about it, help others, speak, minister and be a living breathing reminder of God’s amazing grace. His journey has taken him to hell and back again – and he is able to help others with what mistakes he made, and what mistakes others made in dealing with the prevalent problem of moral failure in the church today – especially among pastors. Ray is happily married to Allison and provides hope, help, advice and counsel for those who are suffering with secrets, pride, or failure of any kind. Ray is down to earth, funny, practical and has found a ministry through the written word. This experience has broken his heart, humbled him and made him a human being again after years of being full of pride and arrogance. I deeply respect him, his great love for people, his beautiful wife and children. You can also follow him on his blog The Fallen Pastor as he journeys through life on the other side of failure – where grace and forgiveness are waiting. I’m proud of you, Ray. You are an inspiration to others who are hurting. Thank you. I have often been asked what I think of hymns, and invariably I will answer, “I like the ones that have been ‘re-done’ to have meaning for this generation.” There are many examples of this. Some we do in our Sunday worship service – and some I hear from my favorite artists. I believe that anytime you speak to a generation and make things relevant and meaningful, there needs to be flexibility on style – not on theology. Many have argued that modern worship choruses tend to be “me centered” – and some of them can be – however, how many people really look closely at some of the hymns? They are often very emotion and “me” driven too. For example, “Love Lifted Me” – talks about the personal experience and emotions. And for that matter, “Amazing Grace” speaks in a personal way as well. Probably why it has gone the distance as everyone can relate with it and it has stood the test of time. Some that I just personally do not care for, would have to be “When the roll is called up yonder” and others like this with very thin content – only repetitive verses and choruses. Are there bad hymns? Oh yes. Are there bad modern worship songs? Yes indeed. I guess finding the balance between the two styles is really the key. I don’t think anyone would claim to say that hymns have everything and should be used exclusively – and in fact they would admit that they do not have a place in most worship services today, if they are left in their traditional format. But most would agree that if made relatable – then they are useful. And new generations can relate and have something passed down from generation to generation, making the old into something brand new. In the same way, the modern worship song has its place today and has great theology and content – if choosing the right ones. I’m a big fan of Gloria Gaither lyrics – as well as other brilliant lyricists like Dottie Rambo and Michael W. Smith from my generation who have graced us with their amazing ability to give us fresh new songs for our worship services and personal reflection. And there are songs written clear back in 1917 that still have relevance for us today – like “The Love Of God” by Frederick Lehman: I just LOVE these lyrics – they are rich and have such beauty. Now here is another fresh voice – Chris Rice in “Untitled Hymn” These lyrics are simple and straightforward – but will speak directly to your heart as well.